The Mummy is a 1999 American action horror film written and directed by Stephen Sommers. The film stars Brendan Fraser, Rachel Weisz, John Hannah, and Kevin J. O'Connor, with Arnold Vosloo in the titular role as the reanimated mummy. It is a loose remake of the 1932 film The Mummy. In this film, adventurer Rick O'Connell travels to Hamunaptra, the city of the dead, with a librarian and her brother. There, they accidentally awaken Imhotep, a cursed high priest from the reign of the pharaoh Seti I. Filming began in Marrakech, Morocco, on May 4, 1998, and lasted seventeen weeks; the crew had to endure dehydration, sandstorms, and snakes while filming in the Sahara. The visual effects were provided by Industrial Light & Magic, who blended film and computer-generated imagery to create the mummy. Jerry Goldsmith provided the orchestral score. The Mummy opened on May 7, 1999, and grossed $43 million in 3,210 theaters during its opening weekend in the United States. The film went on to gross $416 million worldwide. The box-office success led to two sequels—The Mummy Returns and The Mummy: Tomb of the Dragon Emperor—as well as an animated series and the prequel/spin-off film The Scorpion King. In Thebes, Egypt, 1290 BC, high priest Imhotep has a love affair with Anck-su-Namun, the mistress of Pharaoh Seti I. When the Pharaoh discovers the affair, Imhotep and Anck-su-Namun assassinate him. Imhotep flees, while Anck-su-Namun kills herself, intending for Imhotep to resurrect her. Imhotep and his priests steal her corpse and travel to Hamunaptra, the city of the dead, but the resurrection ritual is stopped by Seti's bodyguards, the Medjai. Imhotep's priests are all mummified alive, while Imhotep himself is sentenced to suffer the Hom Dai, the worst of Egyptian curses; he has his tongue cut out and is buried alive with flesh-eating scarab beetles. Imhotep is sealed away in a sarcophagus at the feet of a statue of the Egyptian god Anubis and kept under strict surveillance by the Medjai to prevent Imhotep's return. In 1926, Jonathan Carnahan presents his sister, Evelyn, a librarian and aspiring Egyptologist, with an intricate box and map that lead to Hamunaptra. Jonathan reveals he stole the box from an American adventurer, Rick O'Connell, who discovered the city three years earlier while in the French Foreign Legion. Rick makes a deal with Evelyn to lead them there if they release him from prison. Rick leads Evelyn and her party to the city, where the group encounters a band of American treasure hunters guided by Rick's cowardly colleague Beni Gabor. The expeditions are attacked by the Medjai, led by the warrior Ardeth Bay. Against Ardeth's advice to leave the city, the two expeditions continue to excavate. Evelyn searches for the famous Book of the Living, a book made of pure gold. Instead of finding the book, she, Rick, and Jonathan stumble upon the statue of Anubis and the remains of Imhotep buried underneath. The team of Americans, meanwhile, discover the black Book of the Dead, accompanied by canopic jars carrying Anck-su-Namun's preserved organs. At night, Evelyn takes the Book of the Dead and reads a page aloud, accidentally awakening Imhotep. The expeditions return to Cairo, but Imhotep follows them with the help of Beni. Imhotep returns to full strength by killing the members of the American expedition, and brings the ten plagues back to Egypt. Seeking a way to stop Imhotep, Rick, Evelyn and Jonathan meet Ardeth at a museum. Ardeth hypothesizes that Imhotep wants to resurrect Anck-su-Namun again and plans to do so by sacrificing Evelyn. Evelyn believes that if the Book of the Dead brought Imhotep back to life, the Book of the Living can kill him again, and deduces the book's whereabouts. Imhotep corners the group with an army of slaves. Evelyn agrees to accompany Imhotep if he spares the rest of the group. Imhotep, Evelyn, and Beni return to Hamunaptra, pursued by Rick, Jonathan, and Ardeth. Imhotep prepares to sacrifice Evelyn, but she is rescued after an intense battle with Imhotep's mummified priests. When Evelyn reads from the Book of Amun-Ra, Imhotep becomes mortal again, and Rick forces him into the River of Death. Imhotep leaves the world of the living, but not before vowing revenge. While looting treasure from the pyramid, Beni accidentally sets off an ancient booby trap and is trapped by a swarm of flesh-eating scarabs as Hamunaptra collapses into the sand. Ardeth rides away as Rick and Evelyn kiss and ride off into the sunset on a pair of camels laden with Beni's treasure. 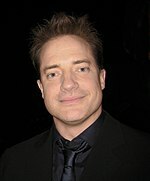 Brendan Fraser plays Rick O'Connell, an American adventurer who served in the French Foreign Legion. Producer James Jacks offered the role of Rick O'Connell to Tom Cruise (who was later cast in the reboot film), Brad Pitt, Matt Damon and Ben Affleck, but the actors were not interested or could not fit the role into their respective schedules. Jacks and director Stephen Sommers were impressed with the money that George of the Jungle was making at the box office and cast Brendan Fraser as a result; Sommers also commented that he felt Fraser fit the Errol Flynn swashbuckling character he had envisioned perfectly. The actor understood that his character "doesn't take himself too seriously, otherwise the audience can't go on that journey with him". Rachel Weisz portrays Evelyn Carnahan, a clumsy but brilliant Egyptologist. Evelyn undertakes the expedition to Hamunaptra to discover an ancient book, proving herself to her peers. The character was named in tribute to Lady Evelyn Carnarvon, the daughter of amateur Egyptologist Lord Carnarvon, both present at the opening of the tomb of Tutankhamen in 1922. Rachel Weisz was not a big fan of horror films but did not see this film as such. As she said in an interview, "It's hokum, a comic book world." South African stage actor Arnold Vosloo plays Imhotep. Vosloo understood the approach that Sommers was going for in his screenplay, but only agreed to take on the role of Imhotep "if I could do it absolutely straight. From Imhotep's point of view, this is a skewed version of 'Romeo and Juliet'." Other major roles include John Hannah as Jonathan Carnahan, Evelyn's bumbling older brother; Kevin J. O'Connor as Rick's cowardly former compatriot in the French Foreign Legion, Beni Gabor. Oded Fehr plays the Medjai Ardeth Bay, Erick Avari museum curator Dr. Terence Bey, and Patricia Velásquez Imhotep's lover Anck-Su-Namun. Minor roles include Bernard Fox as Captain Winston Havelock, a pilot and friend of Rick's, Omid Djalili as an Egyptian prison warden, and Jonathan Hyde, Stephen Dunham, Corey Johnson, and Tuc Watkins as members of the American expedition to Hamunaptra. In 1992, producers James Jacks and Sean Daniel decided to update the original 1932 Mummy film for the 1990s. Universal Studios gave them the go-ahead, but only if they kept the budget around $10 million. Jacks remembers that the studio "essentially wanted a low-budget horror franchise"; in response, Jacks and Daniel recruited horror filmmaker/writer Clive Barker on board to direct. Barker's vision for the film was violent, with the story revolving around the head of a contemporary art museum who turns out to be a cultist trying to reanimate mummies. Jacks recalls that Barker's take was "dark, sexual and filled with mysticism", and that, "it would have been a great low-budget movie". After several meetings, Barker and Universal lost interest and parted company. Director Joe Dante was the next choice, increasing the budget for his idea of Daniel Day-Lewis as a brooding Mummy. This version's draft was written by Alan Ormsby, and was later re-written by John Sayles. It was set in contemporary times and focused on reincarnation with elements of a love story. It came close to being made with some elements, like the flesh-eating scarabs, making it to the final product. However, at that point, the studio wanted a film with a budget of $15 million and rejected Dante's version. Filmmaker George A. Romero was brought in with a vision of a zombie-style horror film similar to Night of the Living Dead, but which also relied heavily upon elements of tragic romance and ambivalence of identity. Romero completed a draft in October 1994, co-written with Ormsby and Sayles, that revolved around female archaeologist Helen Grover and her discovery of the tomb of Imhotep, an Egyptian general who lived in the time of Ramesses II. Unfolding in a nameless American city in modern times, events are set into motion when Imhotep inadvertently awakens as a result of his preserved cadaver having been exposed to rays from an MRI scan in a high-tech forensic archaeology lab. The script progresses to a fish-out-of-water story when Imhotep, having regained his youthful appearance, recognizes the need to adapt to a contemporary society that is three thousand years removed from the one he came from. Assuming at first that he is a representative from the Bureau of Antiquities, Helen finds herself drawn into a tentative relationship with Imhotep while also experiencing clairvoyant flashbacks to a previous life in Nineteenth Dynasty Egypt as a priestess of Isis. Summoning mystical powers through incantation, Imhotep later resurrects the mummy of Karis, a loyal slave whose body had been resting alongside his master's in the same tomb but is now held in the local museum. After escaping into the city sewer system, Karis embarks on a vengeful rampage against the various criminal fences and high society antiquarians who had acquired stolen relics from his tomb. Romero's script was considered too dark and violent by Jacks and the studio, who wanted a more accessible picture. Romero was unable to extricate himself from another contract he had in negotiation with MGM, and so his involvement with the film was severed and the development of an entirely new script was commissioned. Mick Garris was attached to direct but eventually left the project, and Wes Craven was offered the film but turned it down. Stephen Sommers called Jacks and Daniel in 1997 with his vision of The Mummy "as a kind of Indiana Jones or Jason and the Argonauts with the mummy as the creature giving the hero a hard time". Sommers had seen the original film when he was eight, and wanted to recreate the things he liked about it on a bigger scale. He had wanted to make a Mummy film since 1993, but other writers or directors were always attached. Finally, Sommers received his window of opportunity and pitched his idea to Universal with an 18-page treatment. At the time, Universal's management had changed in response to the box office failure of Babe: Pig in the City, and the loss led the studio to want to revisit its successful franchises from the 1930s. Universal liked this idea so much that they approved the concept and increased the budget from $15 million to $80 million. Filming began in Marrakech, Morocco on May 4, 1998 and lasted 17 weeks. Photography moved to the Sahara desert outside the small town of Erfoud, and to the United Kingdom before completion of shooting on August 29, 1998. The crew could not shoot in Egypt because of unstable political conditions. To avoid dehydration in the scorching heat of the Sahara, the production's medical team created a drink that the cast and crew had to consume every two hours. Sandstorms were daily inconveniences. Snakes, spiders and scorpions were a major problem, with many crew members having to be airlifted out after being bitten. Brendan Fraser nearly died during a scene where his character is hanged. Weisz remembered, "He [Fraser] stopped breathing and had to be resuscitated." The production had the official support of the Moroccan army, and the cast members had kidnapping insurance taken out on them, a fact Sommers disclosed to the cast only after shooting had finished. Production designer Allan Cameron found a dormant volcano near Erfoud where the entire set for Hamunaptra could be constructed. Sommers liked the location because, "A city hidden in the crater of an extinct volcano made perfect sense. Out in the middle of the desert you would never see it. You would never think of entering the crater unless you knew what was inside that volcano." A survey of the volcano was conducted so that an accurate model and scale models of the columns and statues could be replicated back at Shepperton Studios, where all of the scenes involving the underground passageways of the City of the Dead were shot. These sets took 16 weeks to build, and included fiberglass columns rigged with special effects for the movie's final scenes. Another large set was constructed in the United Kingdom on the dockyard at Chatham which doubled for the Giza Port on the River Nile. This set was 600 feet (183 m) in length and featured "a steam train, an Ajax traction engine, three cranes, an open two-horse carriage, four horse-drawn carts, five dressing horses and grooms, nine pack donkeys and mules, as well as market stalls, Arab-clad vendors and room for 300 costumed extras". The filmmakers reportedly spent $15 million of the $80 million budget on special effects, provided by Industrial Light & Magic; the producers wanted a new look for the Mummy so that they would avoid comparisons to past movies. John Andrew Berton, Jr., Industrial Light & Magic's Visual Effects Supervisor on The Mummy, started developing the look three months before filming started. He said that he wanted the Mummy "to be mean, tough, nasty, something that had never been seen by audiences before". Berton used motion capture in order to achieve "a menacing and very realistic Mummy". Specific photography was conducted on actor Arnold Vosloo so that the special effects crew could see exactly how he moved and replicate it. To create the Mummy, Berton used a combination of live action and computer graphics. He matched the digital prosthetic make-up pieces on Vosloo's face during filming. Berton said, "When you see his film image, that's him. When he turns his head and half of his face is missing and you can see right through on to his teeth, that's really his face. And that's why it was so hard to do." Vosloo described the filming as a "whole new thing" for him; "They had to put these little red tracking lights all over my face so they could map in the special effects. A lot of the time I was walking around the set looking like a Christmas tree." Make-Up Effects Supervisor Nick Dudman produced the physical creature effects in the film, including three-dimensional make-up and prosthetics. He also designed all of the animatronic effects. While the film made extensive use of computer generated imagery, many scenes, including ones where Rachel Weisz's character is covered with rats and locusts, were real, using live animals. The Mummy: Original Motion Picture Soundtrack was composed and conducted by Jerry Goldsmith, with orchestrations provided by Alexander Courage. The soundtrack was released by Decca Records on May 4, 1999. Like many Goldsmith scores, the main theme uses extensive brass and percussion elements; Goldsmith also used sparing amounts of vocals, highly unusual for most of his work. Overall, Goldsmith's score was well received. AllMusic described it as a "grand, melodramatic score" which delivered the expected highlights. Other reviews positively noted the dark, percussive sound meshed well with the plot, as well as the raw power of the music. The limited but masterful use of the chorus was also lauded, and most critics found the final track on the CD to be the best overall. On the other hand, some critics found the score lacked cohesion, and that the constant heavy action lent itself to annoying repetition. Roderick Scott off CineMusic.net summed up the score as "representative of both Goldsmith's absolute best and his most mediocre. Thankfully [...] his favourable work on this release wins out." 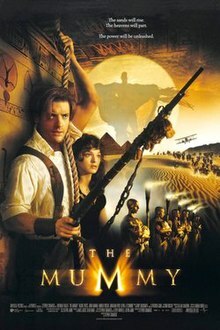 The Mummy opened on May 7, 1999, and grossed $43 million in 3,210 theaters in the United States on its opening weekend. The film went on to gross $415 million worldwide (domestic: $155 million; foreign: $260 million). The Mummy received mixed reviews from critics. On Rotten Tomatoes the film holds a 58% rating, based on 89 reviews, with an average rating of 5.8/10. The website's critical consensus reads, "It's difficult to make a persuasive argument for The Mummy as any kind of meaningful cinematic achievement, but it's undeniably fun to watch." On Metacritic the film has a score of 48 out of 100, based on 34 critics, indicating "mixed or average reviews". Audiences polled by CinemaScore gave the film an average grade of "B" on an A+ to F scale. Roger Ebert, of the Chicago Sun-Times, gave the film 3 out of 4 stars, writing "There is hardly a thing I can say in its favor, except that I was cheered by nearly every minute of it. I cannot argue for the script, the direction, the acting or even the mummy, but I can say that I was not bored and sometimes I was unreasonably pleased." Likewise, Owen Gleiberman of Entertainment Weekly gave the film a "B−" grade and said, "The Mummy would like to make you shudder, but it tries to do so without ever letting go of its jocular inconsequentiality." Bob Graham of the San Francisco Chronicle gave the film high marks for the acting as well as the special effects. Stephen Holden from The New York Times wrote, "This version of The Mummy has no pretenses to be anything other than a gaudy comic video game splashed onto the screen. Think Raiders of the Lost Ark with cartoon characters, no coherent story line and lavish but cheesy special effects. Think Night of the Living Dead stripped of genuine horror and restaged as an Egyptian-theme Halloween pageant. Think Abbott and Costello Meet the Mummy grafted onto a Bing Crosby-Bob Hope road picture (The Road to Hamunaptra?) and pumped up into an epic-size genre spoof." Publications like The Austin Chronicle and Dallas Observer came to the conclusion that despite good acting and special effects, the movie lacked cohesion; talking about the special effects, the Observer lamented "If only generating a soul for the film itself were so easy." Other publications such as Jump Cut felt that Industrial Light and Magic's lock on special effects proved detrimental to The Mummy; "The mummy", Ernest Larson wrote for the Jump Cut, "is standard-issue I.L.&M.". Kim Newman of the British Film Institute judged the picture inferior to the original, as all the time was spent on special effects, instead of creating the atmosphere which made the original film such a classic. USA Today gave the film two out of four stars and felt that it was "not free of stereotypes", a sentiment with which the BFI concurred. "If someone complains of a foul odor, you can be sure an Arab stooge is about to enter a scene. Fraser, equally quick with weapon, fist or quip, may save the day, but even he can't save the picture", USA Today wrote. The entrance to Revenge of the Mummy at Universal Studios Hollywood. The Mummy's box office performance led to numerous sequels and spinoffs. In 2001, the sequel The Mummy Returns was released; the film features most of the surviving principal characters, as a married couple, Rick and Evelyn confront Imhotep and the Scorpion King. The film also introduces the heroes' son, Alex. The two films inspired both an animated series which lasted two seasons, and a spin-off prequel, The Scorpion King (2002), telling the story of the Akkadian warrior as he was crowned king. It also includes three sequels and one prequel. A second sequel, called The Mummy: Tomb of the Dragon Emperor, was released on August 1, 2008. The story takes place in China with the Terracotta Emperor inspiring the villain, while Rachel Weisz was replaced with Maria Bello. The film also inspired a roller coaster, Revenge of the Mummy in three Universal Studios Theme Parks: Hollywood, California; Orlando, Florida; and Sentosa, Singapore. Two video game adaptations of The Mummy were published by Konami under license from Universal Interactive Studios in 2000: an Action Adventure for the PlayStation and PC developed by Rebellion Developments, as well as a Game Boy Color puzzle game developed by Konami Nagoya. On April 4, 2012, Universal announced their plans to reboot the franchise. The film is intended to be the first installment in the Dark Universe, titled The Mummy, and was released in June 2017. ^ "Release". British Film Institute. London: BFI Film & Television Database. Archived from the original on January 3, 2014. Retrieved May 8, 2013. ^ Tasker, Yvonne (2015). The Hollywood Action and Adventure Film. John Wiley & Sons. pp. 20–21. ISBN 9780470659243. Retrieved March 14, 2019. ^ Deming, Mark. "The Mummy". Allmovie. Rovi Corporation. Archived from the original on June 22, 2013. Retrieved December 8, 2012. ^ a b c d e f g h i j Hobson, Louis B (May 1, 1999). "Universal rolls out new, improved Mummy". Calgary Sun. ^ a b c Staff (May 14, 1999). "Show Me The Mummy". Entertainment Weekly. Archived from the original on December 20, 2008. Retrieved April 1, 2008. ^ a b Braund, Simon (July 1999). "Equally Cursed and Blessed". Empire. ^ Doran, Sarah (November 23, 2016). "Did Howard Carter and Evelyn Carnarvon have a romantic relationship?". Radio Times. Immediate Media Company. Retrieved March 14, 2019. ^ a b Jones, Alison (June 26, 1999). "Great Excavations". The Birmingham Post. ^ Roger Ebert (2003). Roger Ebert's Movie Yearbook 2004. Andrews McMeel Publishing. p. 451. ISBN 978-0-7407-3834-0. Retrieved 2010-03-11. ^ a b c d "The Mummy That Wasn't". Cinescape. May 3, 1999. ^ a b c d e Slotek, Jim (May 2, 1999). "Unwrapping The Mummy". Toronto Sun. ^ Chase, Donald (May 3, 1999). "What Have They Unearthed?". Los Angeles Times. ^ Snead, Elizabeth (May 7, 1999). "Updating A Well-Preserved Villain". USA Today. ^ Bonin, Liane (May 7, 1999). "That's a Wrap". Entertainment Weekly. Archived from the original on December 20, 2008. Retrieved April 1, 2008. ^ Argent, Daniel (1999). "Unwrapping The Mummy: An Interview with Stephen Sommers". Creative Screenwriting. ^ a b c d e f "Behind the Scenes". The Mummy Official Site. Universal Studios. 1999. Archived from the original on June 2, 2007. Retrieved May 24, 2007. ^ a b c Portman, Jamie (May 5, 1999). "Mummy Unearths Horror, Humour". Ottawa Citizen. ^ Kent Film Office. "Kent Film Office The Mummy Film Focus". Archived from the original on October 14, 2013. ^ a b c Shay, Estelle (April 1999). "Thoroughly modern Mummy". Cinefex (77): 71–76. On the special effects used in the film, and on the company who made them, Industrial Light & Magic. ^ Slotek, Jim (May 9, 1999). "Mummy Unwraps a New Fraser "Cartoon" Character". Toronto Sun. ^ a b "Allmusic: The Mummy (1999 Original Score)". AllMusic. Retrieved February 12, 2008. ^ a b c d "The Mummy (Jerry Goldsmith) Soundtrack Review". ScoreReviews.com. Archived from the original on February 15, 2008. Retrieved January 1, 2008. ^ a b Coleman, Christopher (2000). "The Mummy by Jerry Goldsmith". TrackSounds.com. Archived from the original on May 22, 2008. Retrieved February 21, 2008. ^ "The Mummy: Editorial Review". FilmTracks.com. Archived from the original on February 28, 2008. Retrieved February 21, 2008. ^ "The Mummy". Box Office Mojo. Archived from the original on November 15, 2006. Retrieved March 14, 2019. ^ Welkos, Robert W. (May 11, 1999). "'Mummy' Brings Sunshine to Universal". Los Angeles Times. Archived from the original on December 22, 2014. Retrieved December 9, 2014. ^ "The Mummy (2007)". Rotten Tomatoes. Fandango Media. Archived from the original on November 3, 2014. Retrieved March 15, 2018. ^ "The Mummy Reviews". Metacritic. CBS Interactive. Archived from the original on November 20, 2010. Retrieved March 15, 2018. ^ "CinemaScore". cinemascore.com. Retrieved March 14, 2019. ^ Ebert, Roger (May 7, 1999). "The Mummy". Chicago Sun-Times. Archived from the original on September 30, 2007. Retrieved November 29, 2006. ^ Gleiberman, Owen (May 7, 1999). "The Mummy". Entertainment Weekly. Archived from the original on December 5, 2008. Retrieved December 19, 2006. ^ Graham, Bob (May 7, 1999). "'Mummy' -- It's Alive". San Francisco Chronicle. Archived from the original on April 19, 2014. Retrieved February 3, 2008. ^ Holden, Stephen (May 7, 1999). "Sarcophagus, Be Gone: Night of the Living Undead". The New York Times. Retrieved November 29, 2006. ^ a b Hinson, Hal (May 7, 1999). "Mummy dearest". Dallas Observer. Archived from the original on December 20, 2008. Retrieved March 20, 2008. ^ Savlov, Mark (May 7, 1999). "The Mummy". The Austin Chronicle. Archived from the original on December 21, 2008. Retrieved March 12, 2008. ^ Larsen, Ernest (July 2000). "The Mummy: traffic in mummies". Jump Cut (43): 12–15, 128. Archived from the original on December 18, 2008. Retrieved April 9, 2008. ^ a b Newman, Kim (June 1, 1999). "Sight and Sound: The Mummy". British Film Institute. Archived from the original on April 10, 2008. Retrieved April 4, 2008. ^ a b Wloszczyna, Susan (May 7, 1999). "Effects New Curse of The Mummy". USA Today. ^ a b Travers, Peter (May 9, 2001). "The Mummy Returns". Rolling Stone. Archived from the original on December 3, 2007. Retrieved April 1, 2008. ^ Garrett, Diane; Fleming, Michael (April 11, 2007). "Fraser returns for 'Mummy 3'". Variety. Archived from the original on April 15, 2007. Retrieved April 12, 2007. ^ Fleming, Michael (May 13, 2007). "Bello replaces Weisz in 'Mummy'". Variety. Penske Media Corporation. Archived from the original on May 16, 2007. Retrieved May 13, 2007. ^ "The Mummy (PSX)". IGN. Archived from the original on February 4, 2008. Retrieved February 21, 2008. ^ "The Mummy (GBC)". GameSpot. Archived from the original on December 9, 2008. Retrieved February 21, 2008. ^ Kroll, Justin; Snieder, Jeff (April 4, 2012). "U sets 'Mummy' reboot with Spaihts". Variety. Penske Media Corporation. Archived from the original on April 7, 2012. Retrieved March 14, 2019. ^ Kroll, Justin (January 21, 2016). "Tom Cruise's 'The Mummy' Gets New Release Date". Variety. Archived from the original on January 22, 2016. Retrieved January 22, 2016.